So I went and finally took the plunge. Went and bought the most expensive computer I have ever bought. 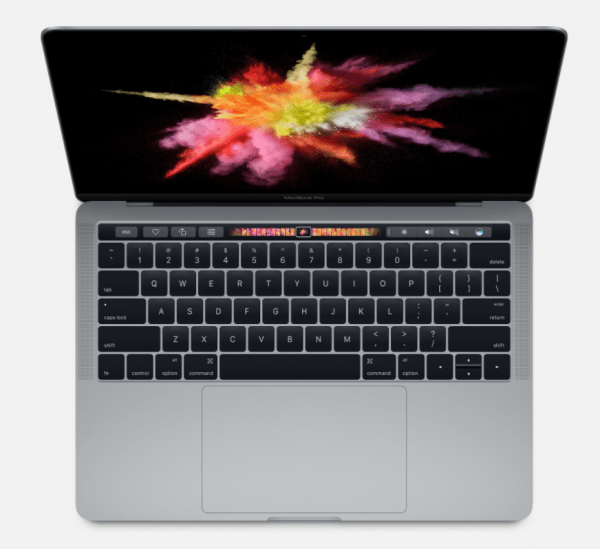 A MacBook Pro 13″ with TouchBar. I went for the base model, which may not boast the best specs of the lot, but still packs in quite a punch for its size. I had spent the whole year waiting for the new MacBook Pros to arrive, and when they finally did, I really had to give myself that Christmas present I needed! For a little more money, you can upgrade your processor (£90), your RAM (£90) or double your storage. Or for even more, you can just shift to the 15″ version, which comes with better specs, and gives you the option to upgrade even more. Of course, you are looking at over £2300 in that case. Ah yes, you get a USB C charger which plugs into what looks like the usual Apple charger, but with a USB-C port on it instead of the cable popping out. There are no adapters to help you plug other USB items into the device. This is an Apple device. Designed in California, and made (assembled, if you believe what they say on the box). Of course it looks pretty. So first of all, let’s start by the weight and feel of the device. It is thin. It is small. 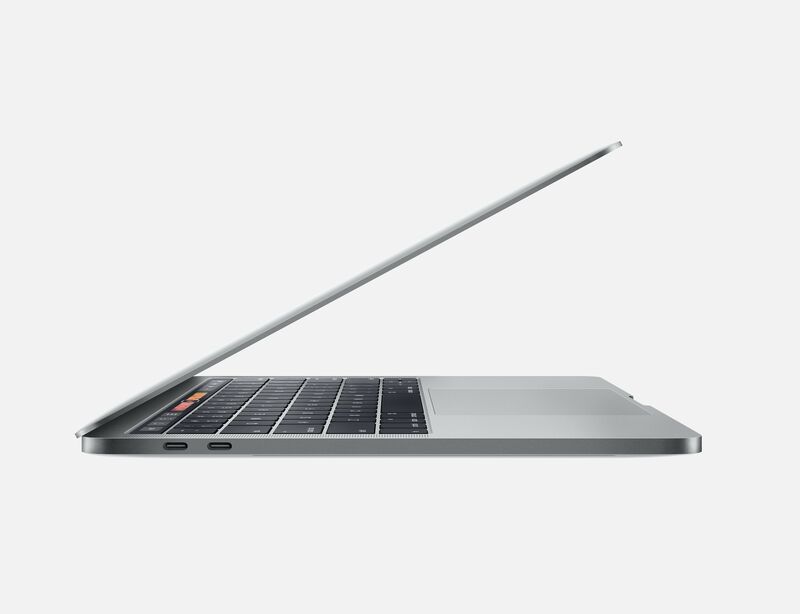 In fact, it is smaller and thinner than what used to be the Macbook Air. This makes it a particular busy device on the inside, but despite all the power packed in, it isn’t much heavier than any other device in the same range. There are some changes over the previous models. 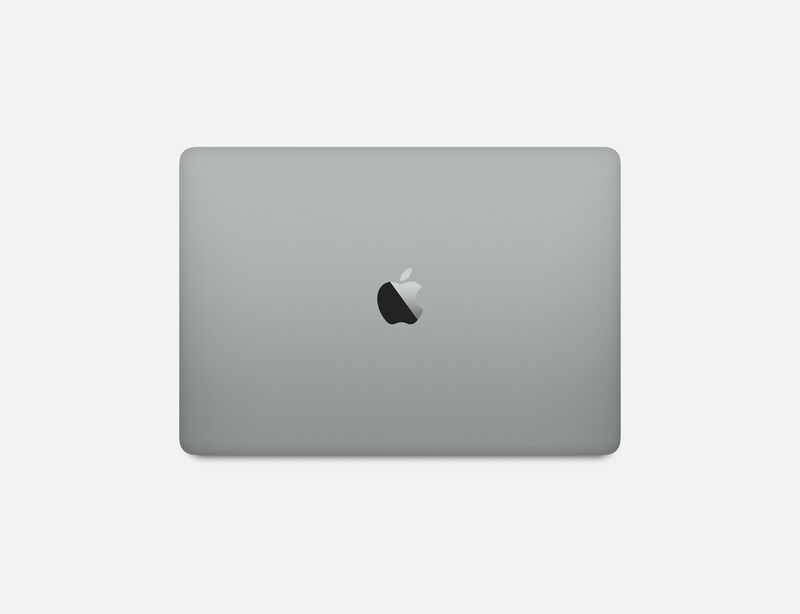 Probably the biggest one in terms of looks is the fact that the Apple logo doesn’t glow any more. The bottom is one smooth curved bit of metal, with nothing but rubber feet. The edges have little slots in them, which are probably for the fans to vent the air in/out. Both sides are rather clean. 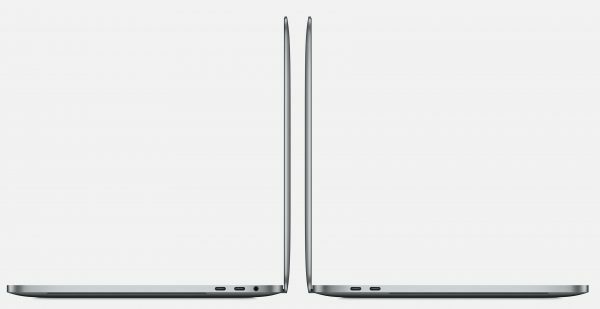 Two Thunderbolt ports which also act as USB C ports. The surprise being that there is actually a headphone slot on the right side as well. Open the device and you are faced with a screen with a thinner bezel than ever before. The biggest standout feature though, is the touch pad. It is huge! Big enough to actually be used with two hands together. Above that is the same old keyboard, even though the keys now have a little less distance to travel on them. Above the keyboard, you have the OLED bar that replaces the Function Key row. This has been called the Touch Bar and the functions it offers are different depending on what app you use. On the top right corner, on the edge of the Touch Bar is a glass square. This is the power button, even though it isn’t labelled as such. It also acts as a Touch ID system. Press this to turn the device on or off. Place your finger on it to log on. In fact, if you share the same device between family, just putting your finger there logs you in and lets you go between users. The TouchBar sits where the Functions keys used to sit. This means that your device doesn’t come with Function keys any more. However, if you press the Fn key on the keyboard, they do pop up. The TouchBar is an OLED strip which displays various buttons depending on what app you are using. That right there is the limitation of the technology. The functionality and its usefulness is purely dependant on the app on offer. Apple have thrown in various features for their own apps, be it Mail or Safari. There are also features coming in for Microsoft Office and Photoshop. Other than that, there is little 3rd party support so far. Google has also been a little quiet on the matter, so we don’t know what we will see in terms of Chrome. The quality of the display on the TouchBar is brilliant. Open your photos app and you will see all your images squeezed into the line. Scroll left or right to go through your timeline. Open Safari and you see your favourites. In Mail, you can reply, forward or delete messages. While composing, you can choose your font or colour. All of this is configurable too. The Touch ID is a glass square that sits on the right edge of the Touch Bar. It allows you to use your finger print, much like the iPhone and many other phones, to log into the device. You can also use this to authenticate your buyings from the Apple Store, and use it in conjunction with Apple Pay. More than that though, it doesn’t do. It is rather handy how well it works. Of the many times I have tried it, it has never failed. It also allows you to shift between various users on the computer, just by putting your fingerprint on it. It does mean that there is no visual indication for the power button on the device, just an empty square. The touchpad is bigger than ever. In fact, it is so big, I find myself using it with both my hands. TouchPad to me is basically what separates the MacBooks from the Windows machines. While Windows is trying hard to play catch up, the touch pads on offer are just no where near as good as those on MacBook. Gestures allow you to do various things like shift between apps and desktops. As time moves on, you build a muscle memory, and before you know it, you have saved loads of time. The OS also deals rather well with any accidental clicking or palm on the touch pad. It simply gets ignored. In fact, I just typed this sentence with my palm on the touch pad. Windows machines need a mouse for better productivity. MacBooks don’t. As simple as that. The keyboard is a slight improvement on the one found in the new MacBooks. There is a bit more travel, and the keys are shaped with curved dips on them, meaning your fingers fall in nicely. The travel is still not quite the same as that you would get on most laptops, but you soon get used to this typing experience. Of course, this is all done in the name of making the device thinner. Is it worth it? Time will tell. However, so far, between the keyboard and the touch bar, I find myself being able to input my thoughts perfectly well. What I did find annoying about the keyboard was that despite being a standard British keyboard, the @ key still sits above 2, and the “/’ key by the Enter key. This is causing some interesting typos on my end. You do get a £ instead of the # on the 3, while the # can be accessed using the alt/option key. The display is brilliant and beautiful. Brighter, more colourful, and sharper, it looks and feels rather beautiful. Yeah, it isn’t as detailed as what is on offer on the higher spec models, but there is absolutely nothing to complain as far as I can see. Small but powerful speakers have been packed into the device. This means that this makes the perfect device for watching Netflix films. This won’t replace your good speakers, but will easily let you use this to make voice calls, watch films, or just have a bit of background music playing. So, here is some of the more disappointing aspect of the device. It promises up to 10 hours of battery life. The numbers weren’t adding up though, and in their latest update, Apple have removed the ‘time remaining’ feature from the OS. At my end, I am getting around 6-7 hours a charge. This is with me using Chrome mostly (which does seem to be an energy hog on Macs) and doing other trivial tasks such as emails and such like. So, Apple has gone ahead and got rid of all the ports we were used to. No USB 3 ports, no HDMI, and no Ethernet ports. Just 4 Thunderbolts, and a headphone jack. Not even a MagSafe port to charge the device any more! It may have been a good move if Apple had packed in a USB C to USB 3 converter in the device, but no, none was on offer. Having said that, I have had this device for a week and not had the need to plug anything in at all, apart from when I have charged this. Yeah, Apple may have been foolish, but they were also incredibly brave. By forcing people away from USB 3, they may have helped the USB C technology to finally get adapted in accessories, from mice to USB sticks. They will be expensive to begin with, but give it a few years and it will all normalise. Of course, plenty of accessories exist for those who need them already. The ports are also used to charge the device. As an extra feature, any of the ports can be used to charge the device. No need to unplug anything. More information on this device as well as configuration options can be found on the Apple website. The current model I am testing came in at £1749. Generally you will find that most Apple products have a universal price tag, no matter where you buy them from. Different companies will throw in various bundles to lure you in though. My current model came from Currys, who are offering a 10% cash-back until 20th December 2016 (tomorrow at the time of writing). You can also find some of the older models with some deals on Amazon as well. Next story Bad Kickstarter – Put some real skin on your device!